Walking down the aisle, I battled with all the choices given to me. We are being spoilt and confused was my constant refrain. The shelves looked so perfectly tabulated and full with these gorgeous boxes of cereal. Sigh! ‘They do it purposely’, was my grumble while I placed the box back precariously. Well, the shopping was taking more time than necessary, and I was in no mood to loiter. So off I went, billed my stuff and got back home in good time to do what I do when in distress. The web caters thousand different varied recipes. (Was running away from all the choices I had to make in the superfood aisle, and here I was, pounded by more!!) Well, did manage to get a gist of what I need to do and the rest was up to me. Yay!! I could throw in what ever I like, how much ever I like and skip what I don’t. Hmm.. pretty neat huh. Getting all the stuff together is a pretty straight forward job, all I found difficult to procure was a pack of old-fashioned rolled oats. 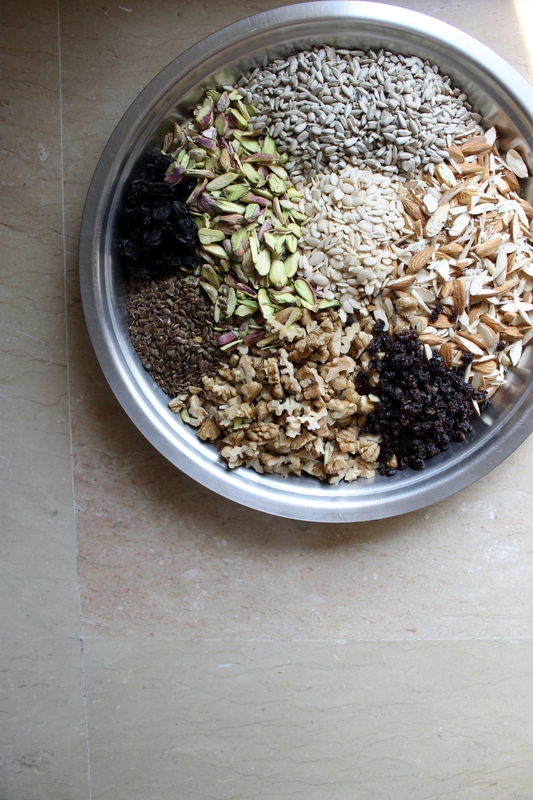 The most common variety is the quick cooking oats which cannot be used here. Well, after a bit of nosing around, I did find and I bought a big box immediately. The best part about making this at home is you can play with the ingredients as you like. Some more of this, less of that, it’s all upto you. 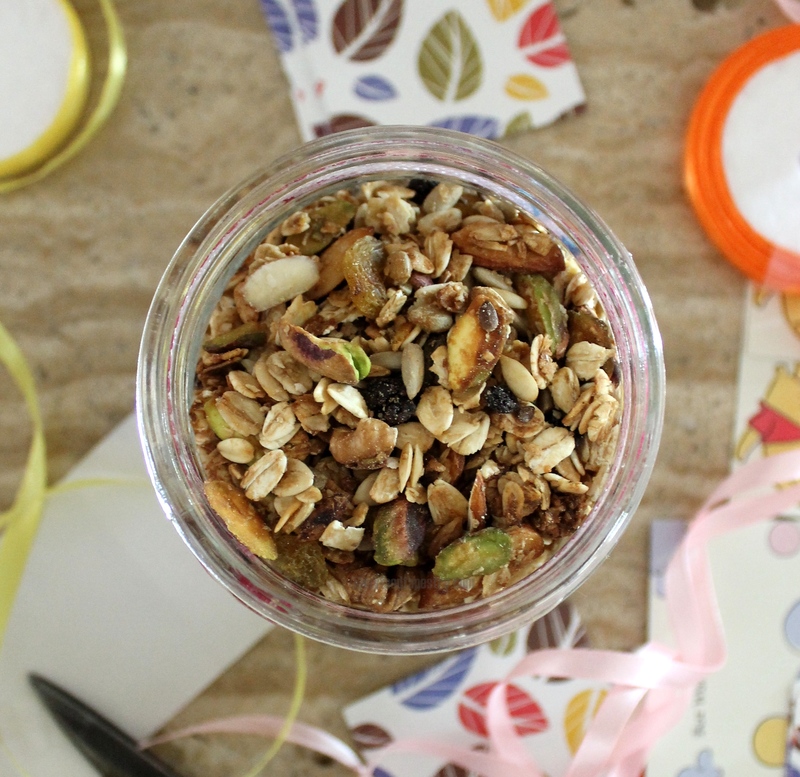 I was so pleased with the results, that I packed small jars for family and friends to enjoy. 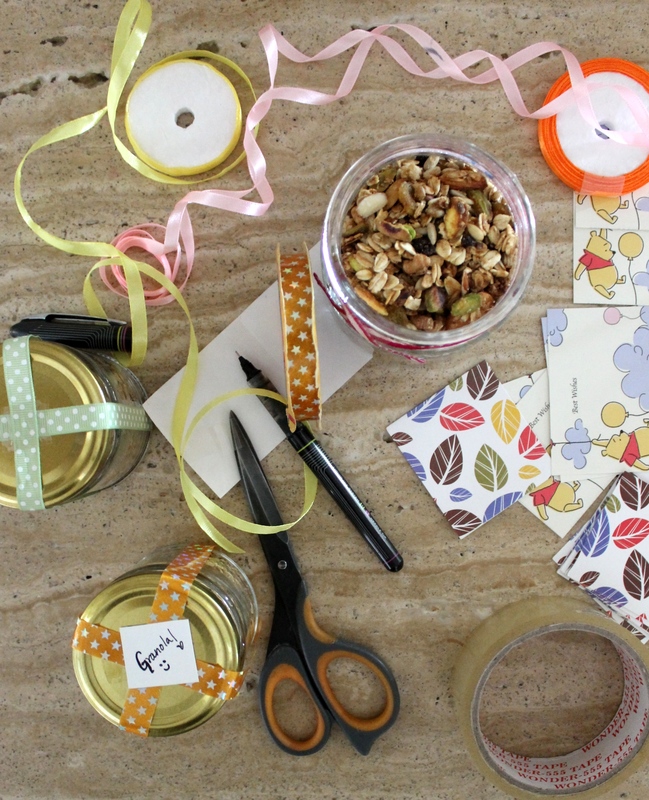 The little jars make such cute gift article that its impossible not to like the look as well as whats in it! Well, children (or rather my child) do not eat it so readily. I coaxed and cajoled, and she did give in to take a tiny bite. But that was it, she didn’t want to do anything more with it. 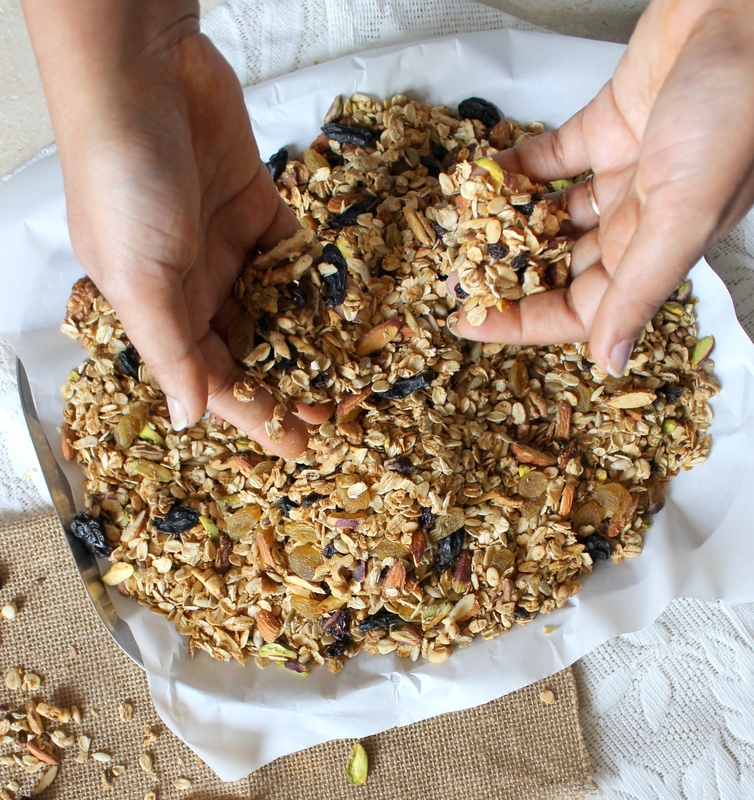 The Recipe: To make about 1 kg granola. Keep the currants and raisins separately. In a saucepan, heat oil, maple syrup or honey, vanilla and salt. Simmer for a minute or two until all ingredients are well combined. 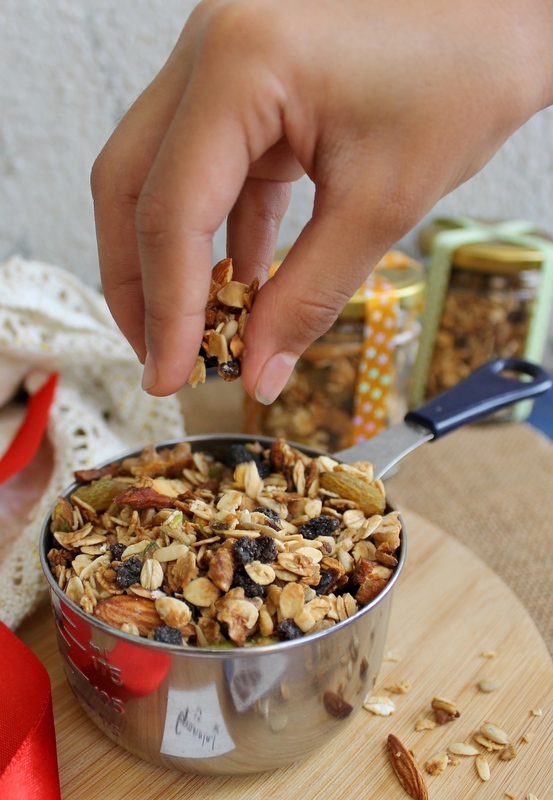 In a huge bowl, take oats, nuts and seeds. Do not add raisins and currants. Pour the honey-oil mix and combine it well. On a lined baking sheet, spread this mix out evenly and bake at 175 C for about 10-12 minutes or till they start to evenly brown. The ideal colour is golden and please take care not to over bake else they turn bitter. Once the oats and nuts are cooked. Remove, Cool. Add raisins an currants. Give it a final toss. Store in airtight containers. Use as required. 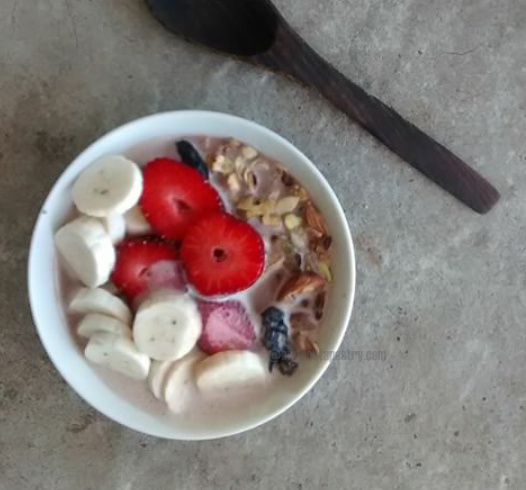 Best Served with – yoghurt and fresh fruits! I usually take mine with fresh fruits and chocolate protein shake. Its one full breakfast! Can you tell me approximately how much honey you need to put?? Also can it be baked in a convection microwave?? If yes would the temperature vary then?? 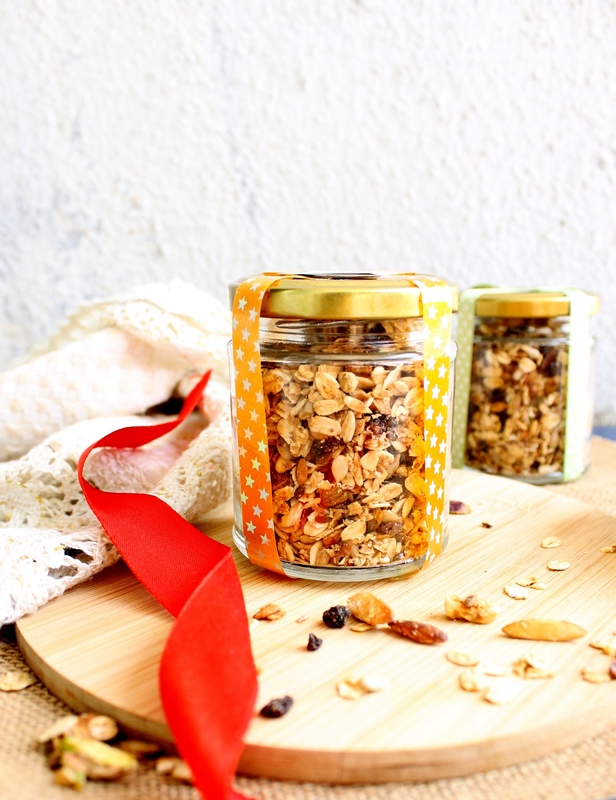 To make a kilo of granola I guess one whole cup of honey is required. So if youre halving the recipe take about 1/2 a cup. I’ve never used a convection microwave but I guess you put it on bake mode n set the temperature as how we set it for toasting garlic bread. Keep an eye throughout. They bake really fast esp after the first batch. 🙂 Thank you Elaine. Inspired to eat healthy by you. Thanks Radhika. Where are you? would love to see a post from your end. yes! I love the fact we can customise it to our liking 🙂 Do try the variant and let me know. 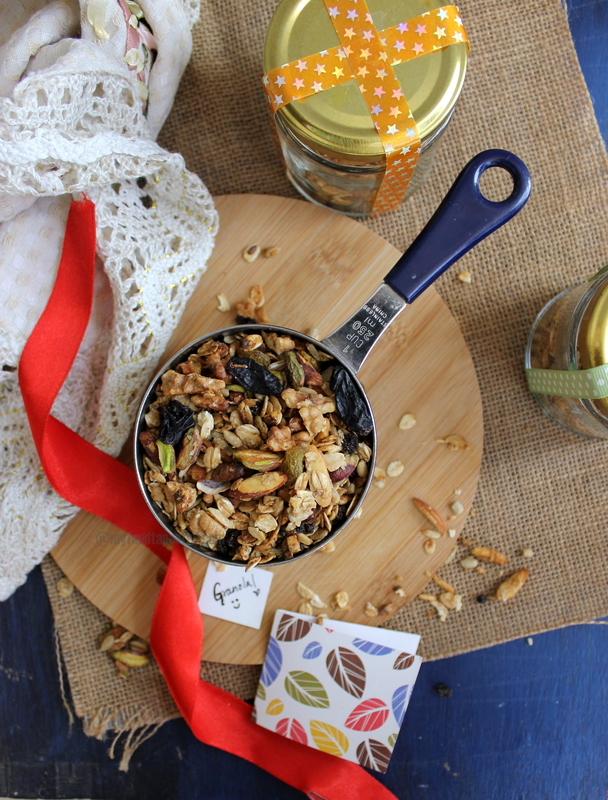 Thanks for your home made Granola.Really its very tasty,delicious & great nutritious value.Enjoyed a lot. Keep posting. Thank you uncle. I am so glad you liked it. 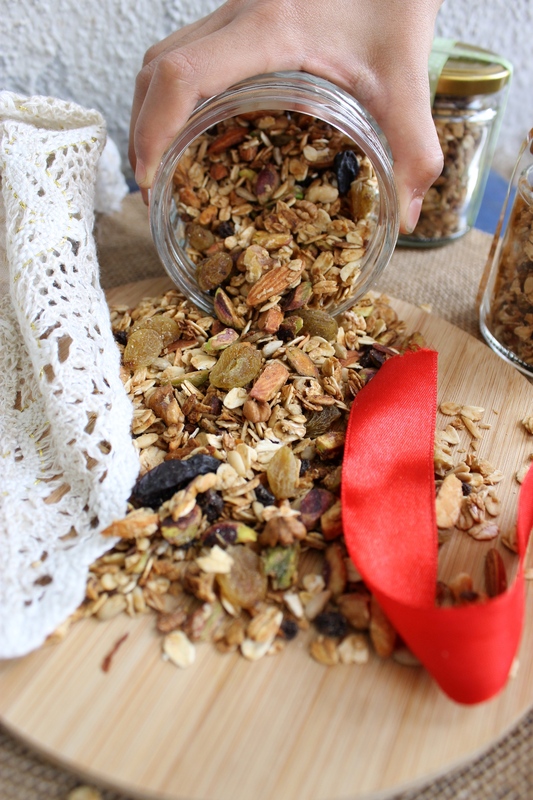 Love homemade granola!! And your version looks just brilliant! 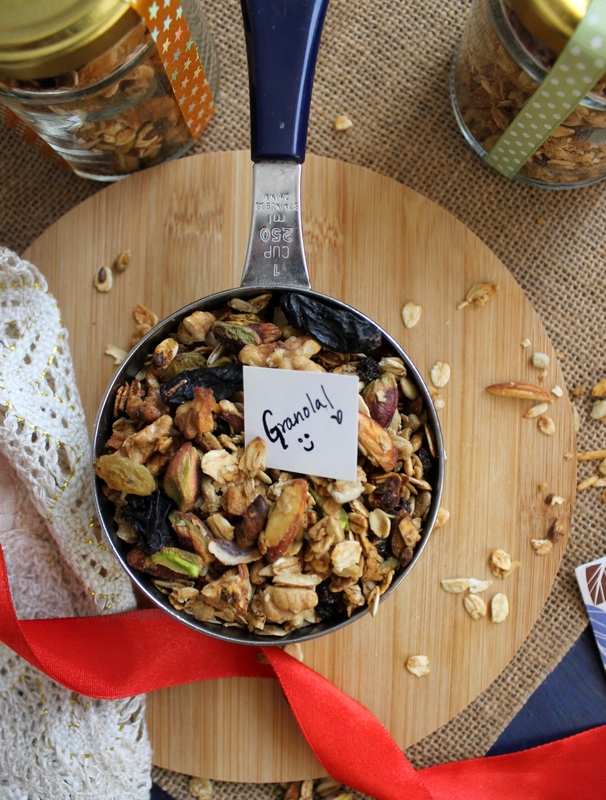 Homemade granola! That is the way to go girlie! Lovely pictures! the first time was a bit scary but have been making several batches hence! You must try.